For over 25 years Clarks Blinds & Screens have been protecting homes and businesses in Warragul with high-quality security doors and security screens. We manufacture all of our security doors and screens in our own factory. This means that your security screen doors are custom made to fit your property. For high-quality security doors and screens in Warragul Contact Us today for a free measure and quote! At Clarks, we stock doors and screens for all needs and budgets in Warragul. Our partnership with Invisi-Gard allows us to offer the highest quality doors and screens. We also have diamond grille doors, alugard and visiongard doors as well as a huge range of colonial style doors to suit almost any home. We can manufacture screens for windows, doors, and sliding doors. No matter the application, we have a security door or screen for you. Invisi-Gard can withstand over 50 consecutive strikes over 100 Joules. This is without any breach of the interface between the aluminium frame and the mesh infill. To put this into perspective, the Australian standard is only 5 consecutive impacts. Invis-Gard uses marine grade 316 stainless steel mesh. Other well-known brands of security doors and screens use grade 304. This is a lesser grade stainless steel. Therefore, doors made with Invis-Gard are built to a higher standard. Invis-Gard screens and doors come in a range of colours. They have a slim design which is more elegant than other security doors. There are no visible fixings on these screens which makes them look great. They give you peace of mind without detracting from the overall look of your Warragul home. Want to know more? 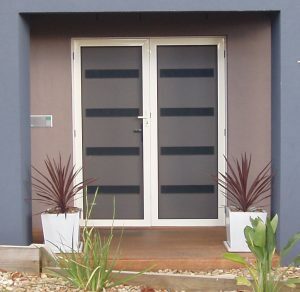 For more information about our range of security doors and screens in Warragul, Vic 3820 contact us today!